Some time has passed since the events in Splatoon as Marie asks for help in dealing with a missing Callie. Along with new fashion and music trends, the game features new weapons, abilities, maps, and modes. Stay fresh! Splatoon 2 is a third-person platforming shooter developed by Nintendo EPD and published by Nintendo for the Nintendo Switch on July 21, 2017. 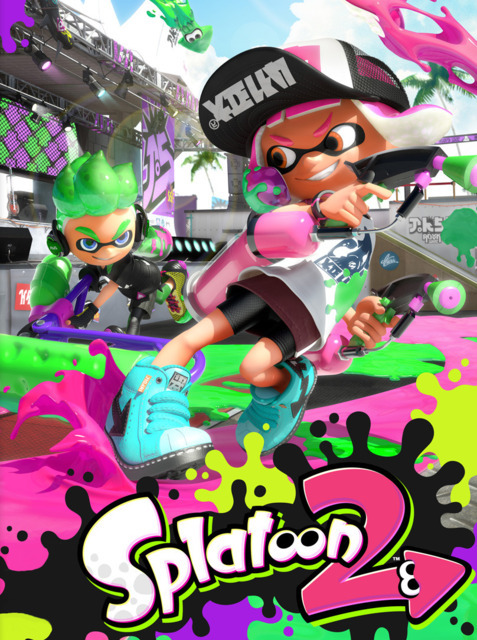 The sequel to the original Splatoon, Splatoon 2 adds a variety of new weaponry and abilities (including dual-wielded splatters that allow combat rolls), as well as a new set of stages, new clothing and hairstyle options, a revamped HUD, and a new co-operative mode (featuring a new set of enemies known as the "Salmonids"). It also expands local multiplayer to support eight-player matches with eight consoles (including both direct wireless and LAN play) with optional spectator support. The game's story takes place nearly a year after the final Squid Sisters Splatfest (where Marie barely wins over her cousin Callie). After finding that Callie and the Great Zapfish are missing, Marie recruits the player (now as "Agent 4") to traverse Octo Canyon to find them. Taking over the Inkopolis News and Splatfest duties is the Off The Hook pop idol duo (Inkling Pearl and Octoling Marina).